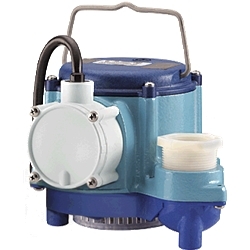 For residential and light commercial use, the 6-CIM manual submersible sump pump provides efficient and reliable service. Pumps has a 1-1/2" discharge with an 18' maximum head. Cast iron motor housing is oil-filled for lifetime lubrication and excellent heat dissipation. Polycarbonate cover and polypropylene volute-base.